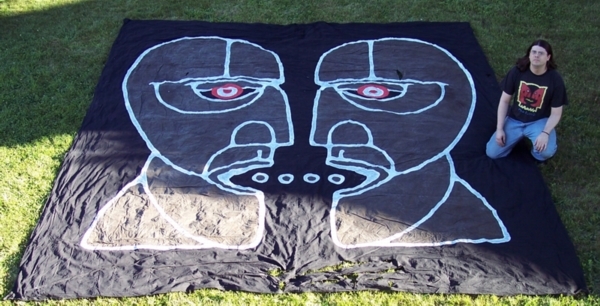 This is one of the many hand painted banners that hung from the rafters of Earls Court during Pink Floyd’s Division Bell shows back in 1994. The purpose of the banners was to improve the sound and dampen the echoing effect of the acoustics of Earls Court. They measure 20’x18′ and you can see this banner and others in P.U.L.S.E. and Storm Thorgerson’s hardcover book, Mind Over Matter – Images of Pink Floyd on page 194.